Harvest 2013 Overview - Mark Hershey Farms Inc. 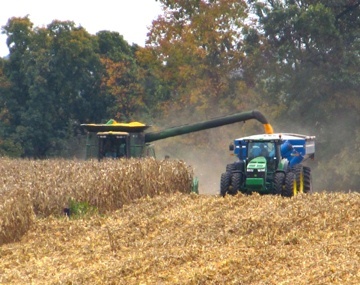 Harvest is in full swing, and the Susquehanna Valley has certainly been blessed with some beautiful weather so far! With little rain and pleasantly warm temperatures, farmers have been hard at work getting their corn and beans cut. At this time of year, we often have customers who inquire about the grain we have been receiving, so we thought we would post a few remarks to keep you in the know. So far the soybean harvest is about 60% complete. This year’s yields are above average; however, they are about 10-12 bushel below last years’ record yields. Corn is about 2 weeks ahead of normal, with excellent yields (some records) on all soil types. Moisture for corn has been mostly below 20%. As long as the weather stays favorable, we expect the good results will keep rolling in. You can check here on our website for our daily cash bids for grain, and for receiving hours. Remember, we adjust our receiving hours according to the weather in order to best accommodate our customers’ needs. If you are a Facebook user, “like us” on Facebook to receive notifications of our daily grain receiving hours, and any changes that might occur. We will do our best to keep you informed, and to get you unloaded quickly when you get here! Keep up the good work, AND BE SAFE! !